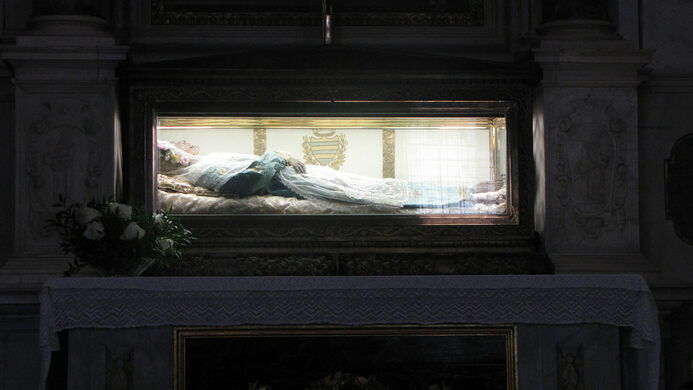 The patron Saint of Lucca, of servants, and of lost keys, lies in rest in the church of San Frediano, dressed and in full view, some 700-plus years after her death in 1272. Zita is one of the “Incorruptibles” — bodies of Catholic saints that were found to miraculously not deteriorate. She began her life as a peasant girl who went to work as a servant in Lucca at age of 12, and was known for her sunny demeanor, work ethic, and for giving leftover bread to the poor. After many years of working as a domestic, she was promoted to head housekeeper, and a series of miracles began to reward her hard work and piety. The story most often related concerns her distribution of bread to the poor. One day, as she was smuggling bread from the home of the family she worked for, a fellow servant ratted her out. When the head of the family pulled open her apron, instead of bread, only flowers fell to the ground. According to legend, when she died at age 60, the church bells spontaneously began to toll. Following her death, her fame spread, becoming closely associated with the town of Lucca. She was mentioned by Dante in his Divine Comedy: Inferno, 21, v 38, in a passing reference that indicates he expected his audience to know who he was talking about. 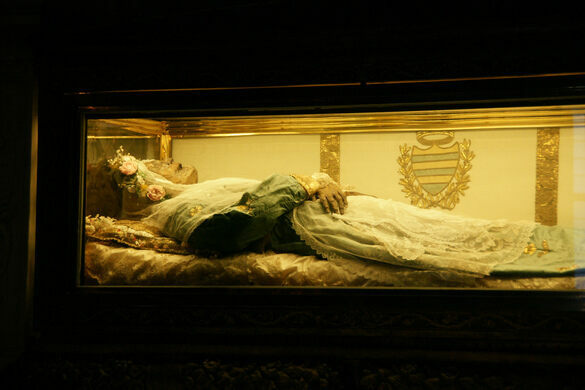 In 1580, her body was exhumed and found to be incorruptible, and her body was put on display in a silver casket, as is tradition, in the church where she had prayed while alive. She was finally canonized in 1696. Although her body is “incorruptible,” it is browned and wizened, most likely the result of a form of natural mummification. Only her hands and face are uncovered for viewing. In 1988, her body was examined by Gino Fornaciari of the University of Pisa. His studies concluded that she had died of lung problems, probably associated with inhaling coal dust and smoke. 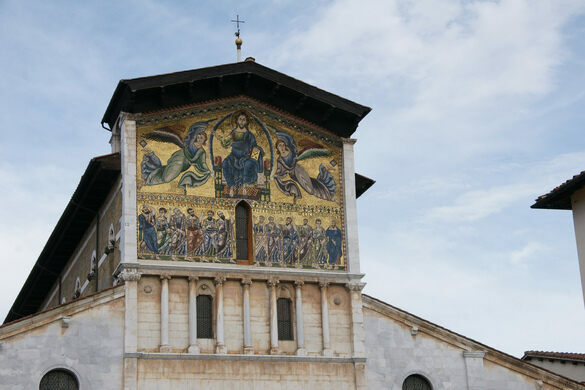 Every year on April 27, citizens of Lucca bake bread and bring flowers (often daffodils) to San Frediano in celebration of her feast day, and the saint is brought out to be touched by the pious. Her body is on display in a chapel on the inside right hand side of the church. Visitors to the Church might also look for two other curiosities, the “American Chapel” and the tomb of St. Richard the King. The American Chapel is the first chapel on the right side as you enter the Church, right next to St. Zita’s Chapel. Until the 1700s it was the site of a cemetery, but then it was decided to build a chapel on the site, which was consecrated on July 4, 1776. Soon after, locals made the connection with the new United States, and the chapel became the site of local “American” religious celebrations beginning about 1800. On September 11, 2001, as news of the U.S. tragedy reached Lucca, townspeople spontaneously made their way to this chapel in solidarity, and soon the Bishop of Lucca came to offer Mass, attended by the then Communist mayor and town council, with crowds of people spilling into the surrounding streets. The chapel also, curiously, serves as a shop for religious items. If you are an American, mention that to the clerk, who may regale you American Chapel lore. St. Richard the King (sometimes called Richard the Pilgrim) was a King of Wessex, brother in law to the great St. Boniface, who was on pious pilgrimage to Rome, when he took sick and died at Lucca, surrounded by his saintly children, (later Saints) Winibald, Willibald, and Walburga. His tomb is a freshly restored large medieval high relief altar piece, in the major chapel on the front left side of the Church.